Hela, the goddess of Hel, just got married to secure her throne. But, the marriage was to a suitor that nobody was expecting. SPOILERS for Thor #4 by Jason Aaron and Mike del Mundo follow. Thor and Loki recently traveled to Hel, the realm of the dead. The realm is also the frontline of the war against Sindr, the daughter of Surtur and ruler of Muspelheim. Sindr has aligned her realm with Malekith the Accursed, the dark elf who has plunged nearly all 10 realms of the World Tree into the War of the Realms. Once they arrived, Thor and Loki were reunited with their brother Balder the Brave, the ruler of Niffleheim and regent of Hel. Balder has been leading the dead in their battle against Sindr. With him is his lover, Karnilla of the Norns, as well as Skurge the Executioner. The heroes waylaid a shipment headed toward the opposing forces’ encampment to take what they believed to be a superweapon. What they actually found was Loki’s children — Hela, the deposed former ruler of Hel, and her brother, Fenris Wolf. Hela is dead set on regaining her lost throne and attacks the group of Asgardians, but Loki came up with a plan and halts the fighting. He’s able to convince Hela and Balder that Hel needs to be united if it has any of surviving Sindr’s assault. 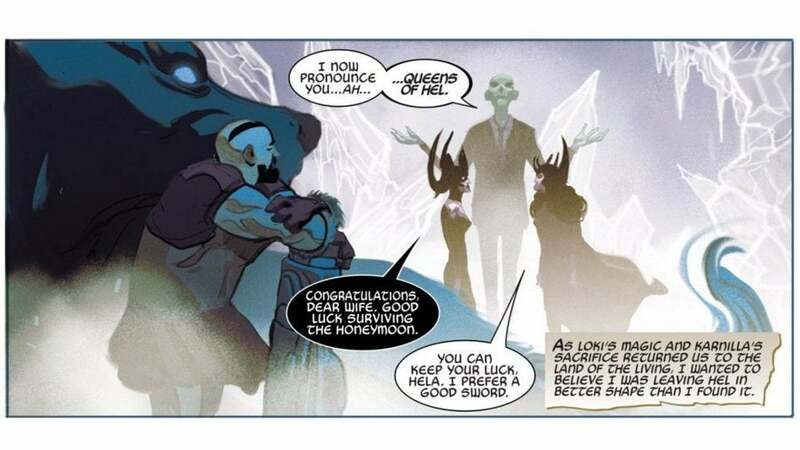 Loki suggests that Hela and Balder should marry and co-rule over Hel. Hela and Balder reluctantly agreed to go through with Loki’s plan. Though Karnilla was not happy about the arrangement, she pressed Balder to go through with it for the good of the realm. But, Hela neglected to mention that she was already in a relationship, and that’s when her boyfriend Thanos showed up. Hela assumed that Thanos was there to help her take the throne by force, but she was wrong. Thanos was actually there to dump Hela. He quickly takes out a single monster in Sindr’s service and then departs to continue his quest for the Infinity Stones. With the wedding ceremony in chaos, Karnilla sees an opportunity and convinces Loki to help her. As Hela and Balder argue about whether the ceremony will proceed, Karnilla slips a wedding ring on Hela’s finger and says “I do.” With that, the ceremony is complete and she and Hela are bound together as co-ruling queens of Hel. As part of the deal, Karnilla also convinced Loki to bring Balder back with him to the realm of the living, restoring the fallen favorite son of Odin to life. What do you think of the unorthodox wedding of Hela and Karnilla? Let us know in the comments! Thor #4 is on sale now.